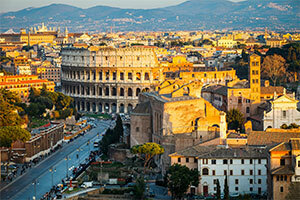 If you want to enjoy a city break, then take in one of Europe’s most exciting cities with a visit to Rome. With ancient landmarks hidden round each and every corner, this is a city best explored on foot, at your own pace. Camping Fabulous is perfect for providing somewhere lovely to rest, relax and rejuvenate before exploring the picturesque streets and landmarks of the city. Vatican City Built over the tomb of St Peter, Vatican City is the world’s smallest independent state. Visit St Peter’s Basilica and the Vatican Museums – including the Sistine Chapel – or take a tour of the extensive Vatican Gardens. The Colosseum This massive structure, built on the site of Nero’s Palace, was designed so tens of thousands of people could watch gladiatorial combat, wild animal fights and even mock sea battles. Tickets include a visit to the Roman Forum and Palatine Hill. Trevi Fountain The Trevi Fountain is dominated by the figure of Neptune in a sea-shell chariot. Throwing a coin over your shoulder into the water is said to ensure that you will return to the Eternal City. The Pantheon Not far from the Trevi Fountain, the Pantheon has the world’s largest un-reinforced concrete dome. Built by the Emperor Hadrian, this temple was dedicated to all the gods, and later to St Mary and all the martyrs. To find your perfect campsite in Rome please use our interactive site finder, call our knowledgeable customer advice team on 01 242 1901, or go straight to the individual campsite pages.